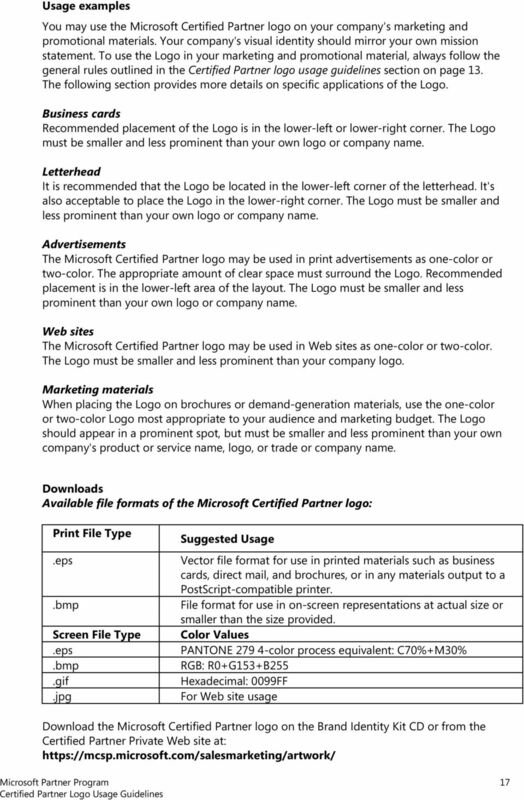 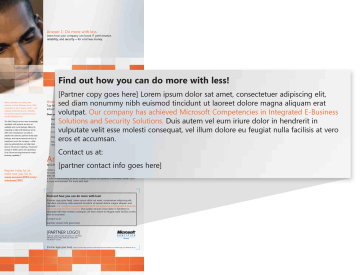 Download "Microsoft Partner Program Certified Partner Logo Usage Guidelines"
1 This document provides guidelines on the use of logos and visual brand elements on all Microsoft partner marketing and collateral materials. 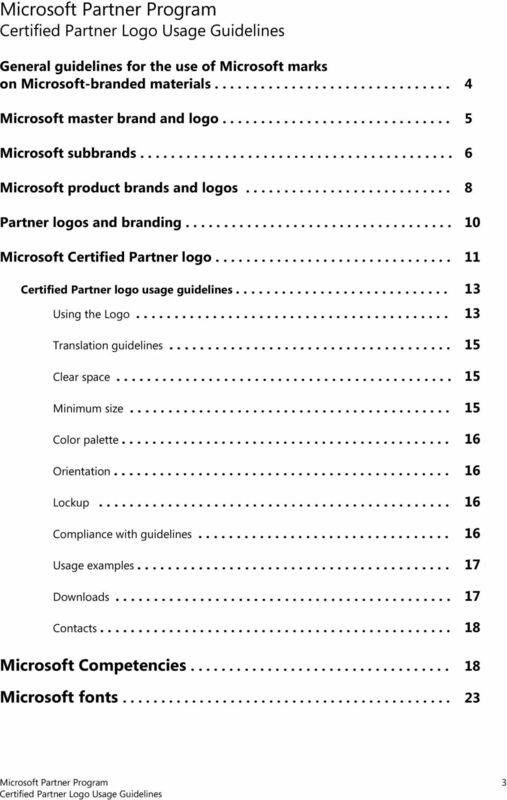 Regardless of whether they originate from Microsoft or the partner, all these materials fall into two categories: Microsoft-branded and partner-branded. 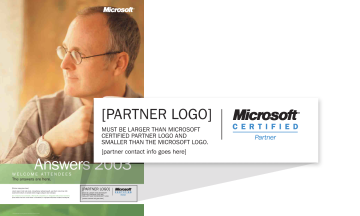 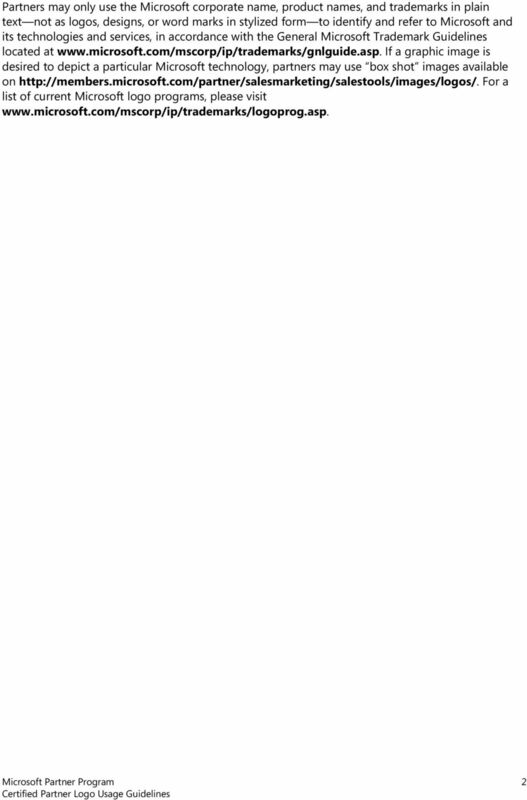 These Microsoft Partner Program do not authorize partner use of Microsoft logos, content, or other Microsoft branded elements. 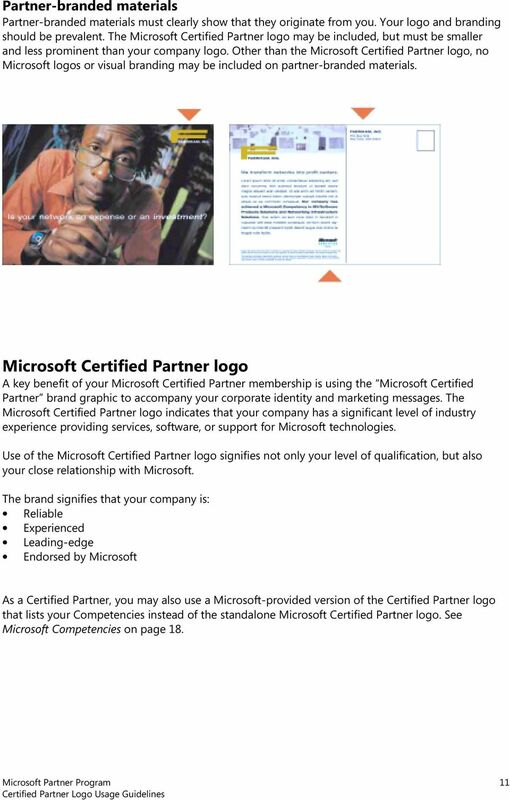 A partner must be a Microsoft Certified Partner with a valid Agreement in place in order to use the trademarks, logos, symbols, and names (collectively, the Microsoft marks ), content, and other visual brand elements that appear in the Microsoft materials. 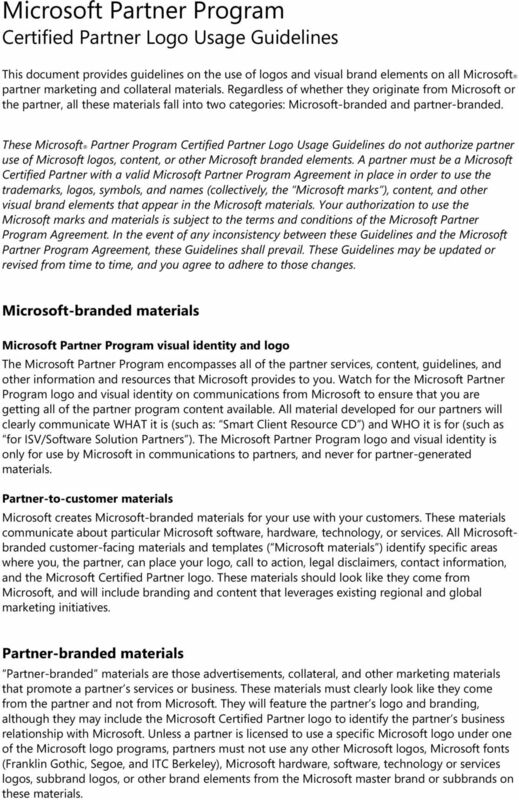 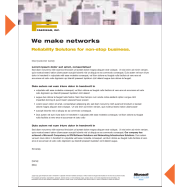 Your authorization to use the Microsoft marks and materials is subject to the terms and conditions of the Microsoft Partner Program Agreement. 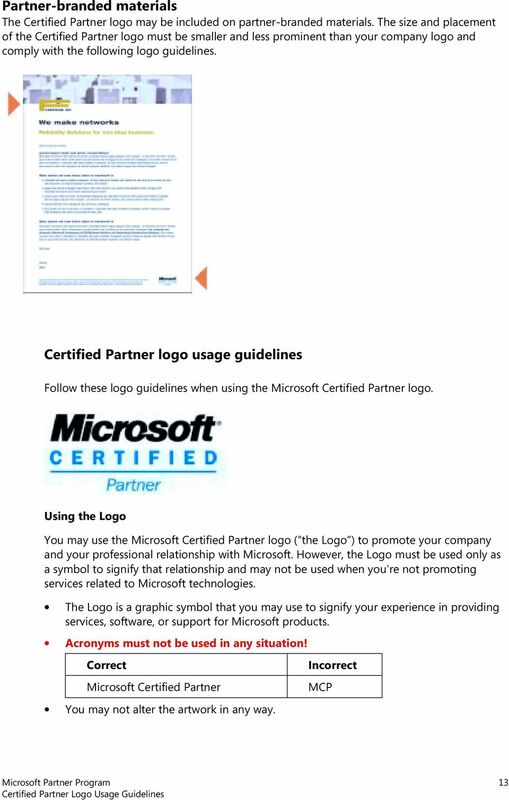 In the event of any inconsistency between these Guidelines and the Microsoft Partner Program Agreement, these Guidelines shall prevail. 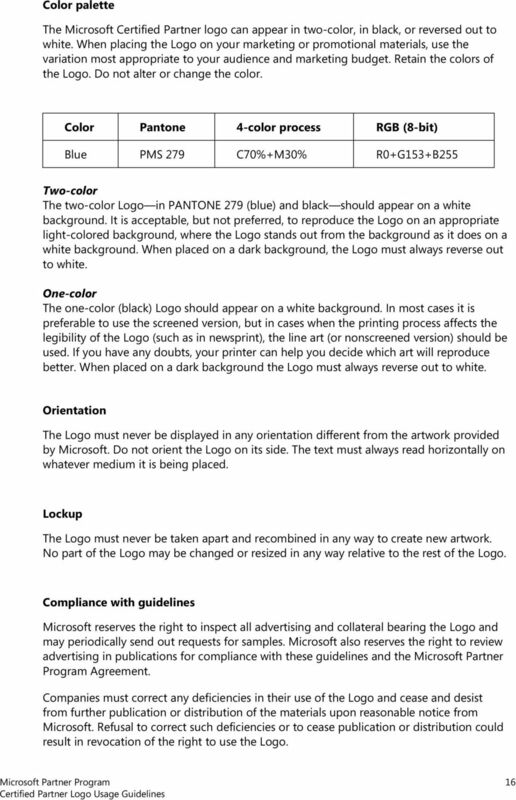 These Guidelines may be updated or revised from time to time, and you agree to adhere to those changes. 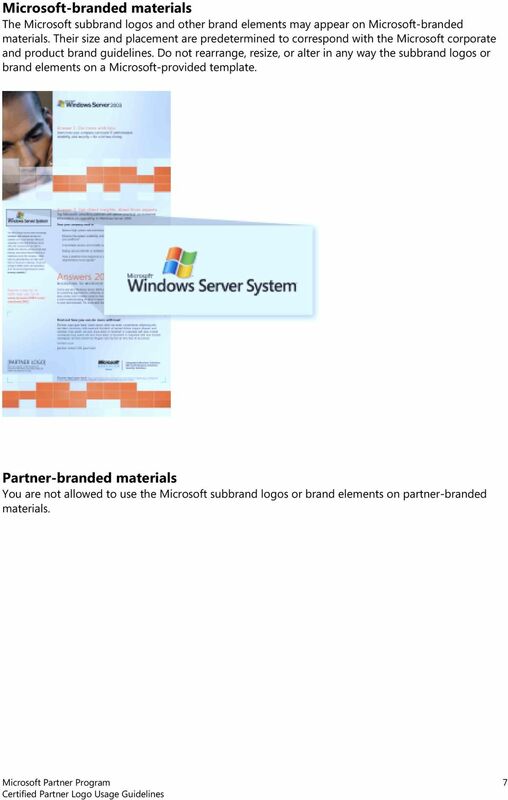 Microsoft-branded materials visual identity and logo The encompasses all of the partner services, content, guidelines, and other information and resources that Microsoft provides to you. 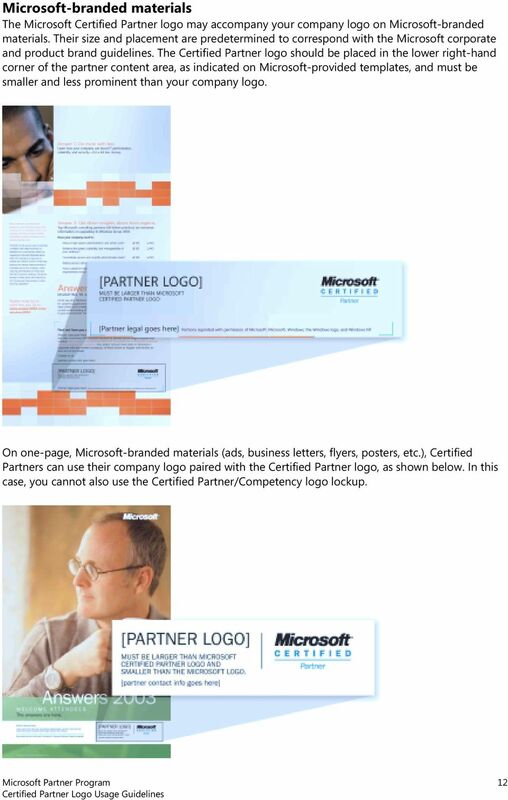 Watch for the Microsoft Partner Program logo and visual identity on communications from Microsoft to ensure that you are getting all of the partner program content available. 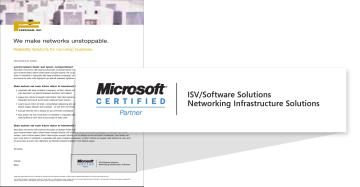 All material developed for our partners will clearly communicate WHAT it is (such as: Smart Client Resource CD ) and WHO it is for (such as for ISV/Software Solution Partners ). 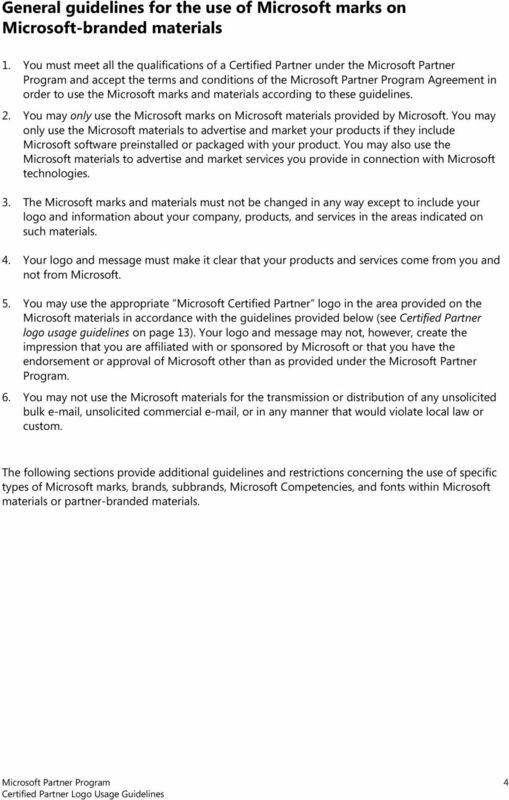 The logo and visual identity is only for use by Microsoft in communications to partners, and never for partner-generated materials. 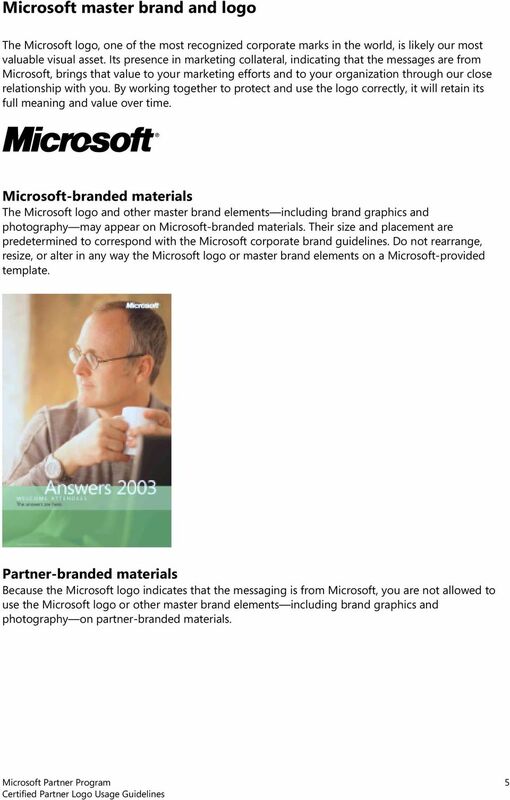 Partner-to-customer materials Microsoft creates Microsoft-branded materials for your use with your customers. 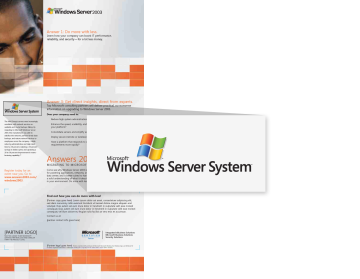 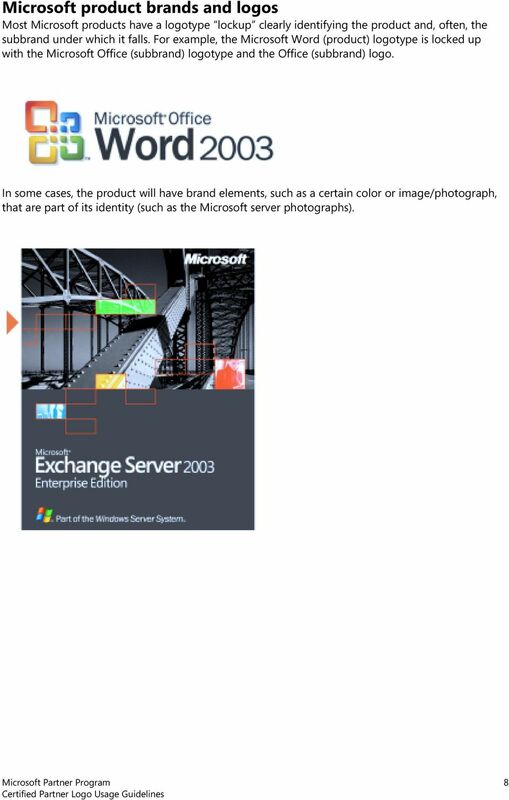 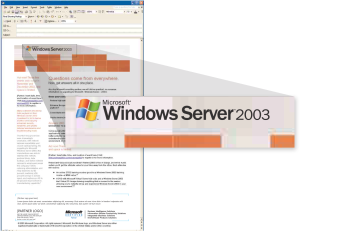 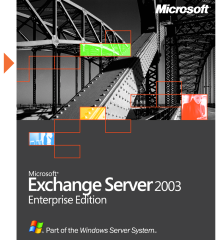 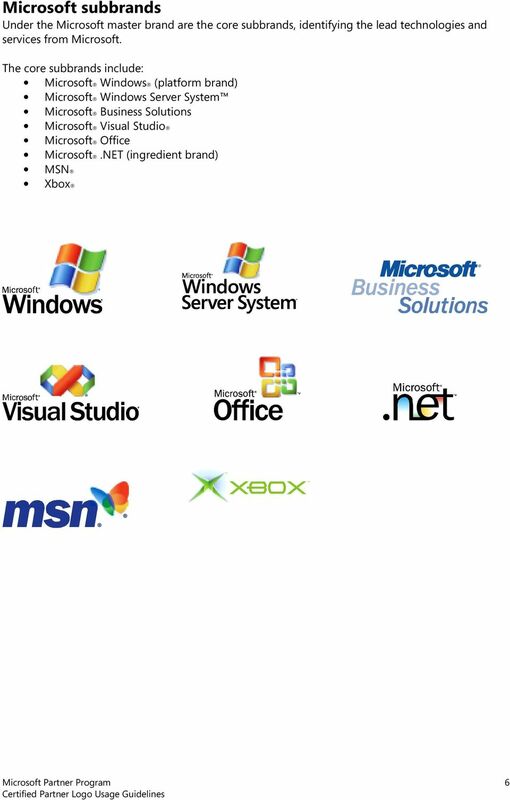 These materials communicate about particular Microsoft software, hardware, technology, or services. 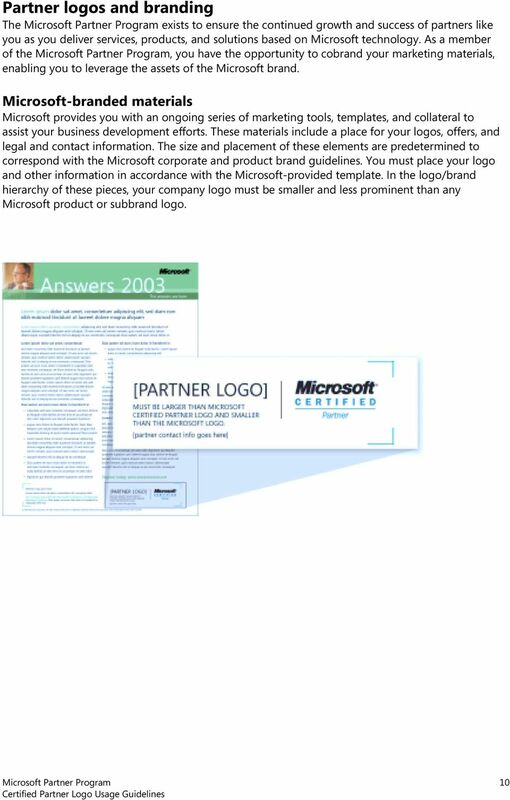 All Microsoftbranded customer-facing materials and templates ( Microsoft materials ) identify specific areas where you, the partner, can place your logo, call to action, legal disclaimers, contact information, and the Microsoft Certified Partner logo. 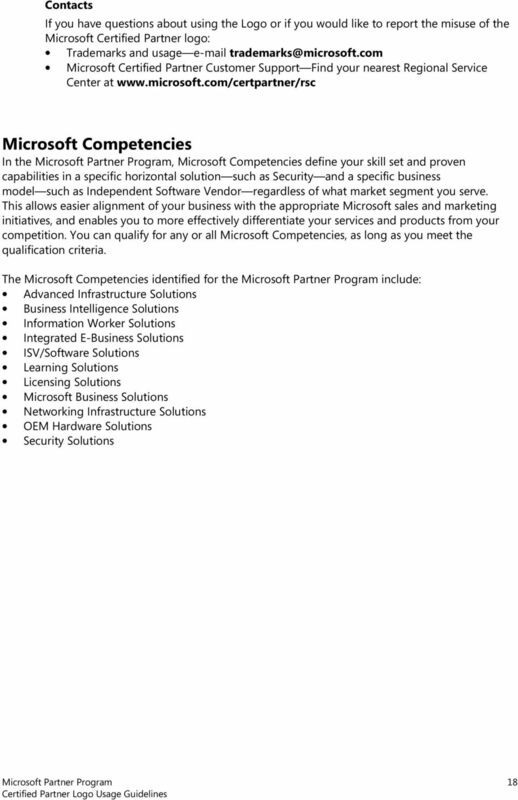 These materials should look like they come from Microsoft, and will include branding and content that leverages existing regional and global marketing initiatives. 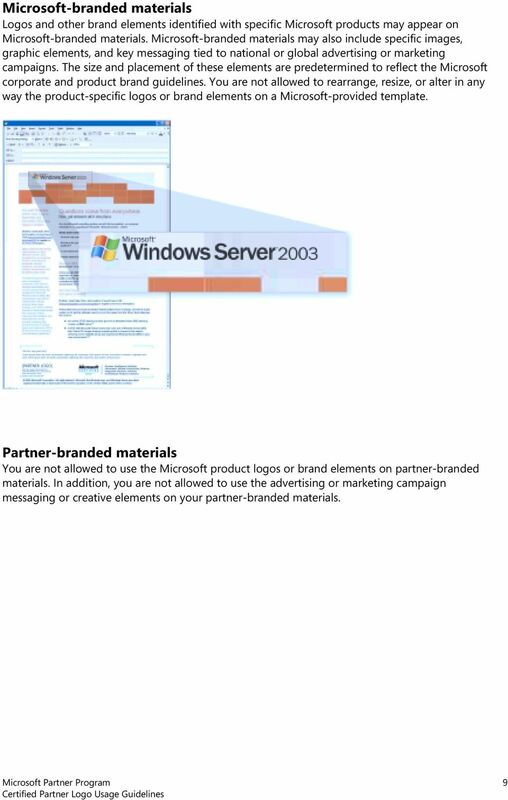 Partner-branded materials Partner-branded materials are those advertisements, collateral, and other marketing materials that promote a partner s services or business. 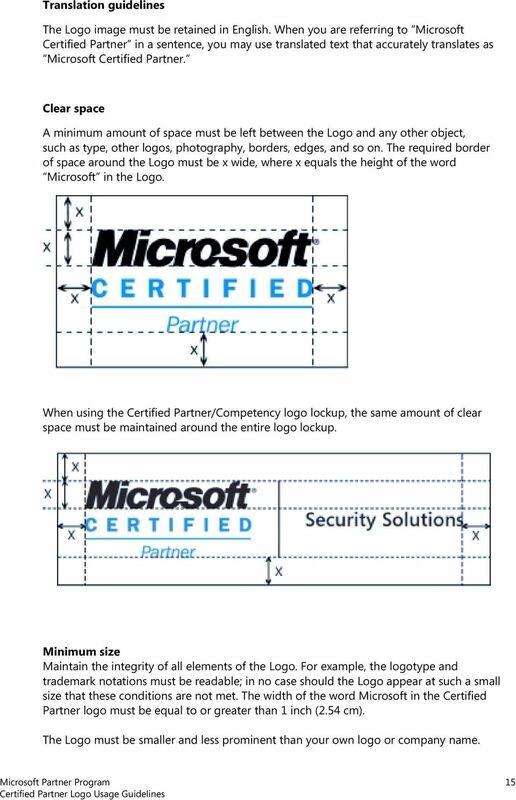 These materials must clearly look like they come from the partner and not from Microsoft. 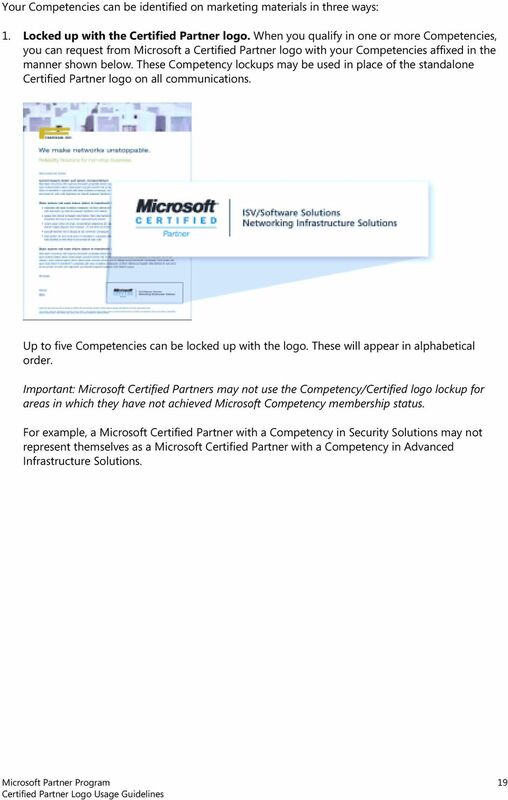 They will feature the partner s logo and branding, although they may include the Microsoft Certified Partner logo to identify the partner s business relationship with Microsoft. 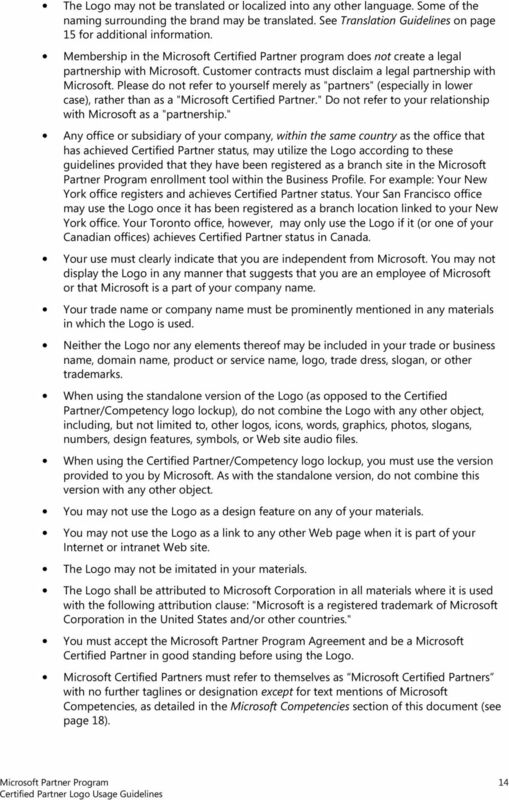 Unless a partner is licensed to use a specific Microsoft logo under one of the Microsoft logo programs, partners must not use any other Microsoft logos, Microsoft fonts (Franklin Gothic, Segoe, and ITC Berkeley), Microsoft hardware, software, technology or services logos, subbrand logos, or other brand elements from the Microsoft master brand or subbrands on these materials. 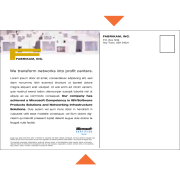 Protecting the power of a pure identity.